Winter–Spring 2018 — Eugene School District 4J is engaging in a community conversation about improving the condition and design of our aging school buildings. It’s time to prioritize needs for the future of our schools. Why talk about replacing or renovating schools? 4J’s schools are at least 50 years old, aside from the eight schools replaced with taxpayer support of the 2002 and 2013 bond measures. Some buildings are approaching the end of their useful life. 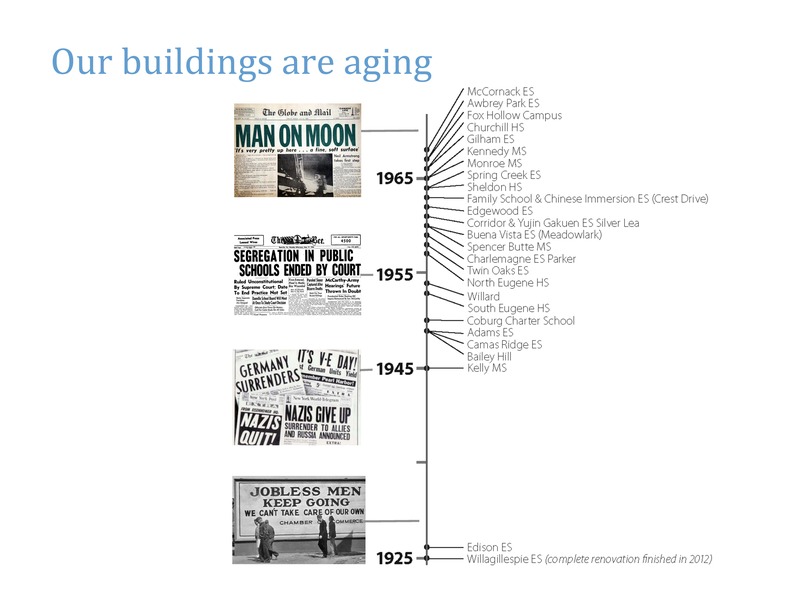 These older buildings are inefficient and costly to heat and cool. They require many repairs. What’s more, our older school buildings were designed for an earlier era. They don’t support modern teaching and learning activities. They were not designed with safety and school security in mind. They don’t easily integrate modern technology that is critical to a child’s education today. Why consider replacement or major renovations and not just repairs? Schools built for an earlier age can have some of their physical flaws repaired, but their lifespan will still be shorter and their basic design will still be outdated. Schools today are designed differently because teaching and learning are different. In generations past, each teacher worked alone, instructing a small classroom of students arranged in neat rows. Schools were designed as long strings of classrooms set side by side. Today, teachers often work together. They group students in different ways throughout the day to provide effective instruction. Students take part in more interactive and hands-on projects. Modern schools have bigger classrooms to provide flexible learning spaces and accommodate today’s larger class sizes. They provide spaces for special education. They feature common spaces that allow small group activities, create opportunities for teacher collaboration, and foster a sense of community. Modern schools are designed to be safer for students. They allow staff to better monitor and control who enters and leaves the building. They are designed to eliminate nooks and crannies, where students are out of sight and can get into trouble. Energy savings: Newer, more efficient school buildings save on utilities as well as maintenance and repairs. 4J’s newer schools are cheaper to operate even though they are used year-round and have cooling systems that older schools lack. Local construction jobs: In the past, local and regional firms have bid on and won 4J construction contracts, creating local jobs. Modest tax impact: As we pay off past bonds, we have the opportunity to structure new bond repayments to reduce increases in tax rates. Interest rates are also low, reducing borrowing costs. Every student deserves to go to school in a building that maximizes their potential to learn. Every family deserves access to equitable and appealing school choices. Replacing or renovating some of our aging schools would provide strong, attractive school options in each of the district’s four school regions. Together we can plan for the future of our schools.